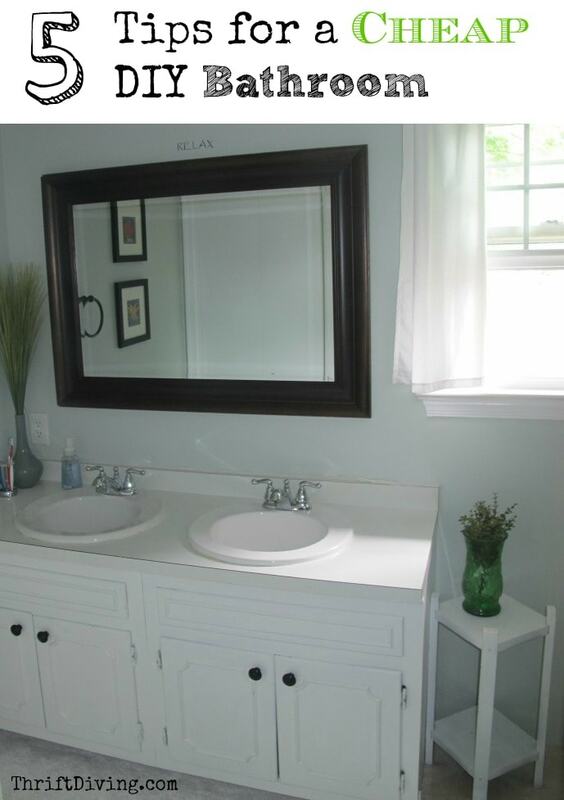 I’m a little envious of all you people who have gorgeous new bathrooms. 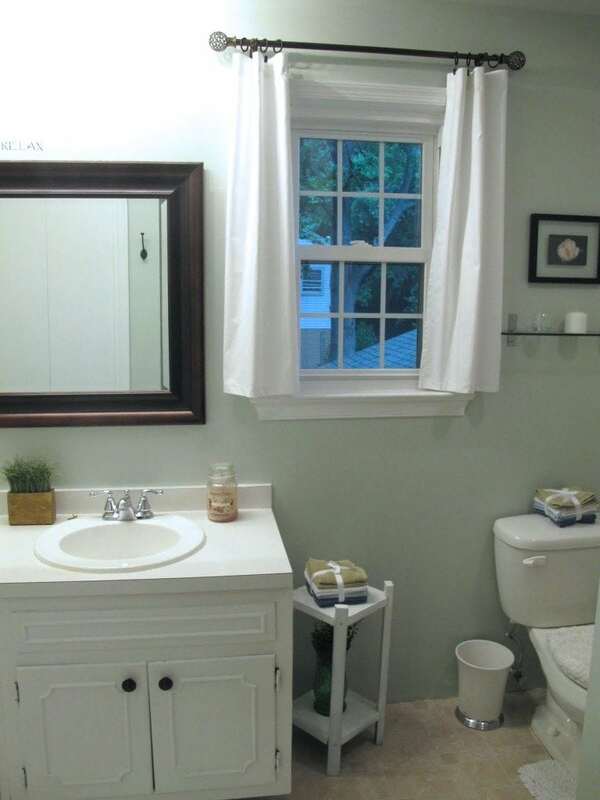 You know–the newly renovated or newly built homes that come with that big ‘ole jacuzzi tub that you never use but sure are glad you have “just in case” you ever want to hop in. You don’t have stale wallpaper. Oh–and your floor is ceramic or marble instead of crusty ‘ole peel n’ sticks vinyl. 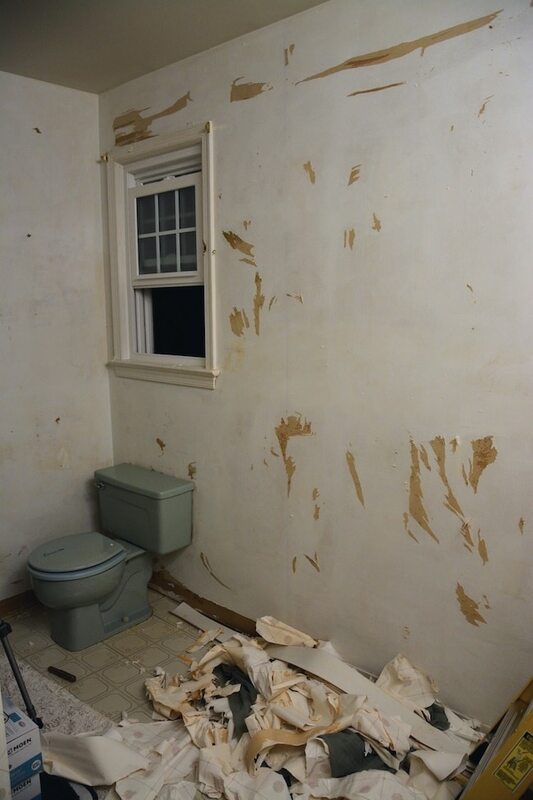 Now……This is what my bathroom used to look like! I know….I still can’t believe it, either!! I still think wallpaper should be banned. It’s a you-know-what to remove. 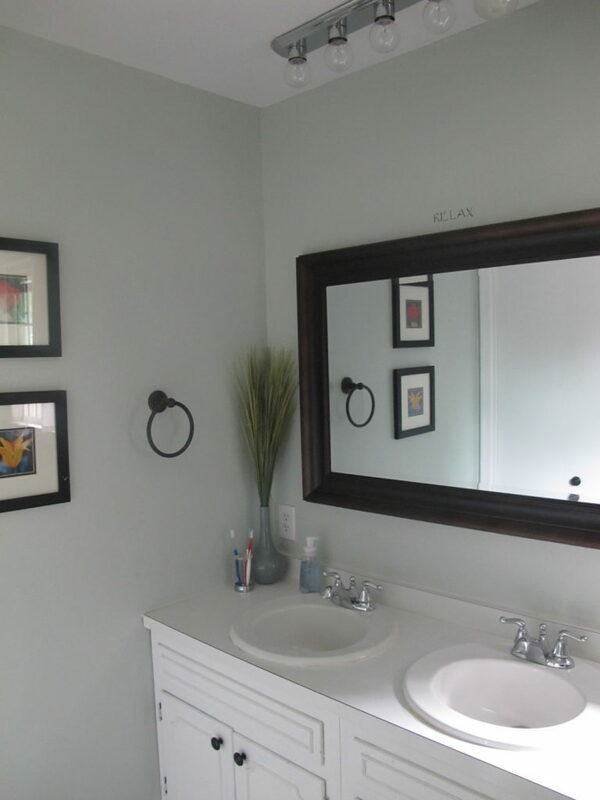 But this pretty shade of Sherwin Williams Sea Salt paint was worth the trouble! 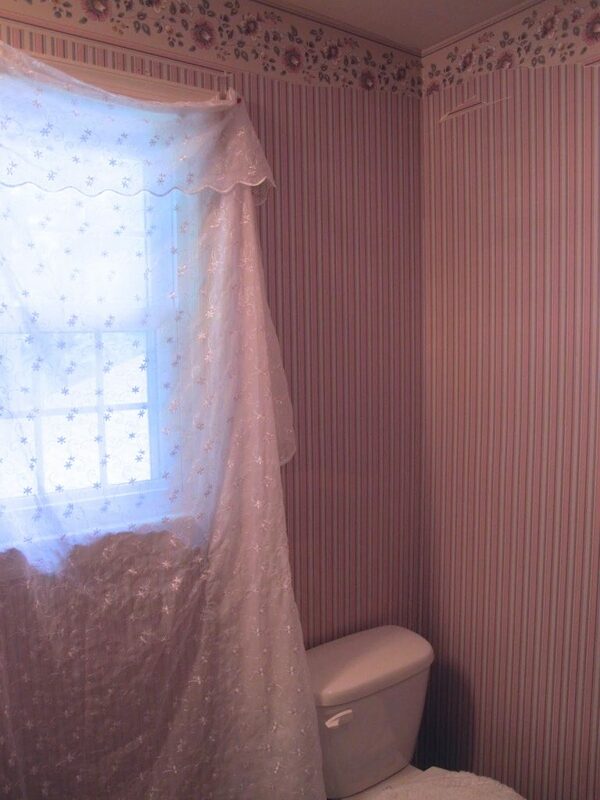 Before DIY’ing it, I’m embarrassed to say that we lived with a doily shower curtain up at the window for at least 6 months. But after a lot of hard work, the result was astounding. 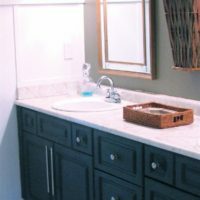 If you’ve got a bathroom that needs a lot of work and is outdated, here are some thrifty tips to help you transform it on a budget! TIP #1 Embrace Your Eye Sore! So someone mentioned recently that they had PINK TILE in their bathroom when they moved in. YIKES. 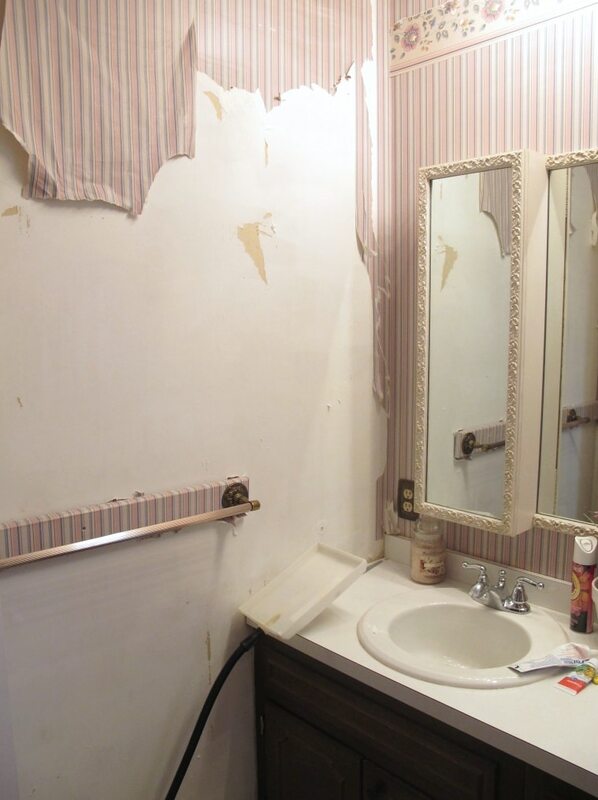 Do you also have an eye sore in your bathroom? For me, it was this turquoise shower. See it over there, with the outdated brassy door?? Now, in a recent post, I told you that I wish everything in my house could be turquoise. True enough. But my SHOWER?? Um, yeah, that’s a bit much. However,when we moved in, that’s what was here. And we don’t have tons of money yet to rip it out and install a new shower. The solution? Decorated around your eye sore. 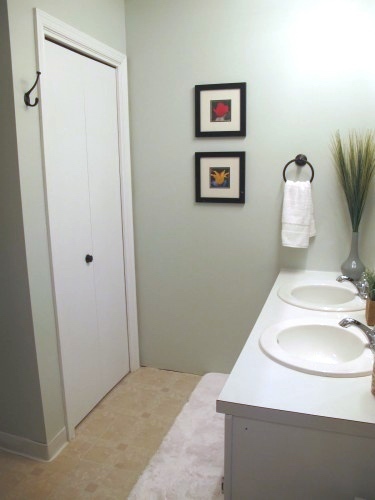 TIP# 2 Just because it SAYS it’s a robe hook……. …doesn’t mean you have to hang your robes on it. Have you seen the price of decent towel bars?! Expensive. 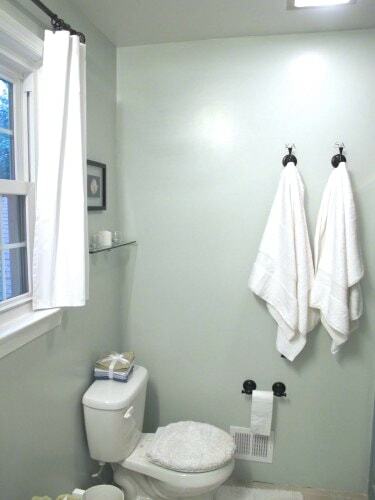 So grab some cute robe hooks and toss your towels on it instead. Trust me, they rarely fall off. And for, like $12, you’ve got something cute to hang your towels from instead of paying double or triple for a towel bar. TIP #3 Unleash your inner photographer. This is seriously one of the cheapest ideas. First, let me say that I’m terrible about decorating my walls. If you were to come over to my house, you would see huge blank walls of nothing. I take tons of pics but rarely do they end up getting printed. 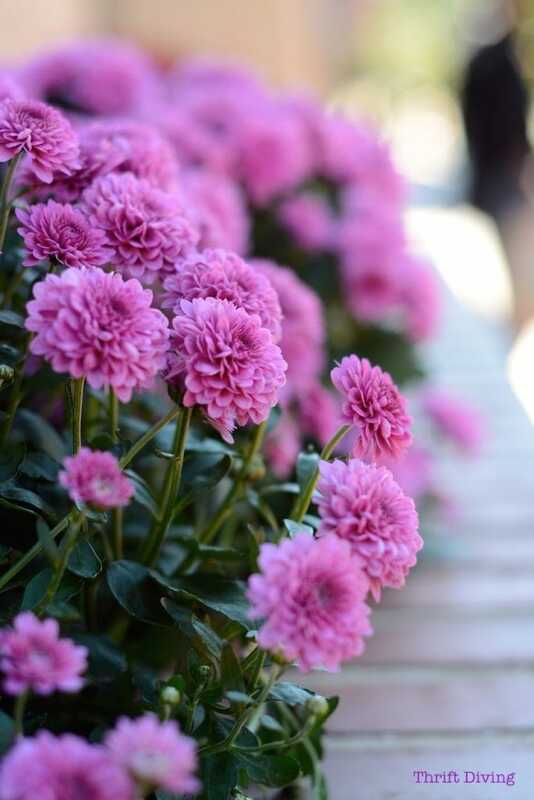 Go take some amazing pictures of flowers or landscapes (read my 10 tips for creating awesome wall art) , or whatever floats your boat, and then print them. Pick up some cheap frames from the thrift store. And then grace your walls with all your awesome shots! If you read my post 10 Tips to Create Awesome DIY Floral Art, you’ll be able to take some really awesome shots to get framed. Here’s one I took recently and plan to blow up. If you take shots like these, bathroom wall art would be super cheap. TIP#4 Get it all covered! This plush rug I got from Home Goods covers up half of the little floor on this side. I chose white because it blended best. But if you have the money, I whole-heartedly recommend SnapStone flooring to cover old vinyl tile. It’s a real porcelain tile that has a rubber tray on the back that allows you to go right over your old vinyl flooring. I’m pretty sure the two layers of vinyl I have here has some asbestos. 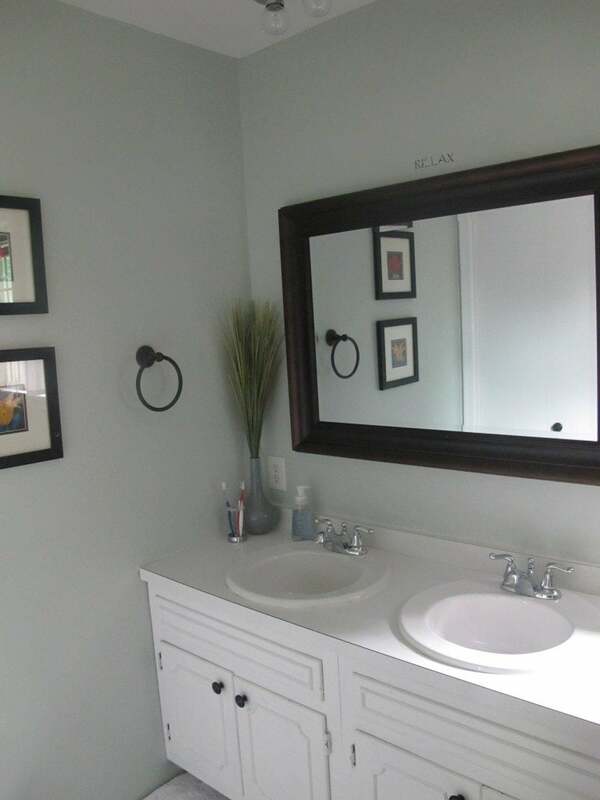 Instead of removing it, which could be more expensive to hire a professional to do, I just tiled over it with SnapStone (see my kids’ bathroom makeover to see how it’s done). I’ll be posting on my YouTube channel soon a full-tutorial on how to install SnapStone flooring to cover a vinyl floor, so don’t forget to subscribe so you don’t miss when that video comes out soon. But regarding cost, SnapStone can be expensive. If you have the budget, go for it. If not, stick with rugs until you’ve saved up money for it. 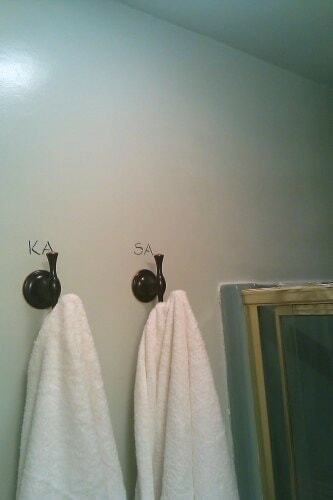 My real estate agent/friend gave me THE best tip for cheaply sprucing up any bathroom. And that is: change out the mirror. I went to Home Goods and chose a mirror for $60 that traditionally goes in the living room or something, and put it up in the bathroom. It was a WORLD of difference! 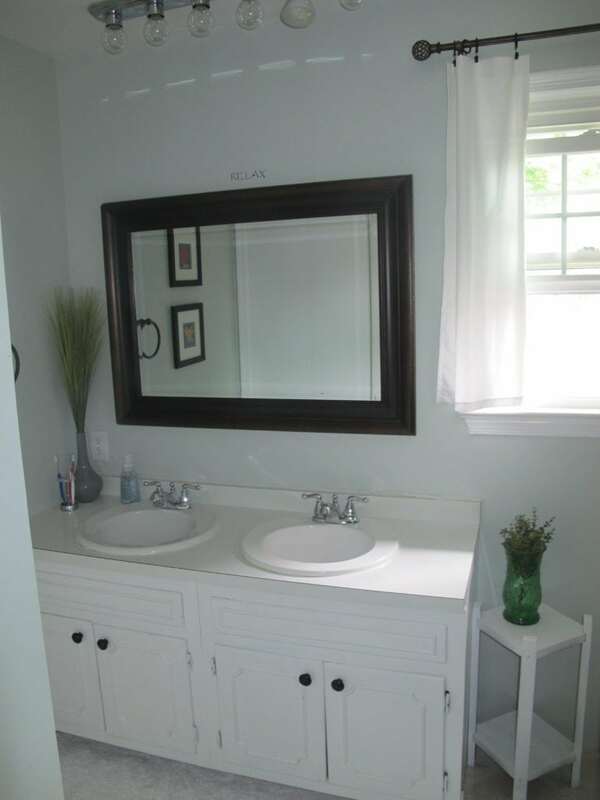 Doing that, with fresh white paint on the vanity (which didn’t get changed out), and it looks like a whole new bathroom! If you want to read more about some of the other crazy work that I had to do in this bathroom, you can see the original post here. 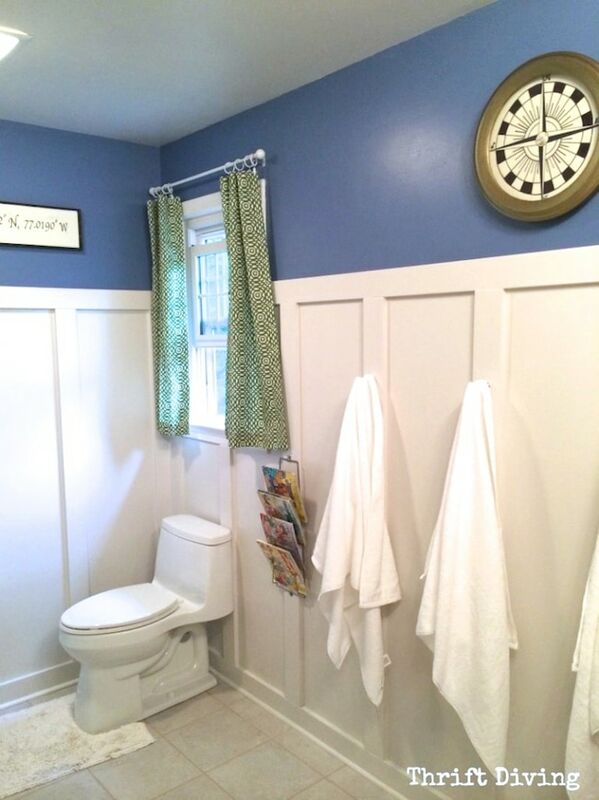 I Also Made Over My Kids’ Bathroom! 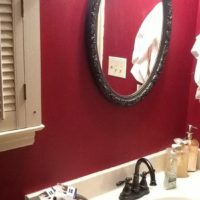 Since doing my master bathroom, I have did my kids’ bathroom makeover on a budget. 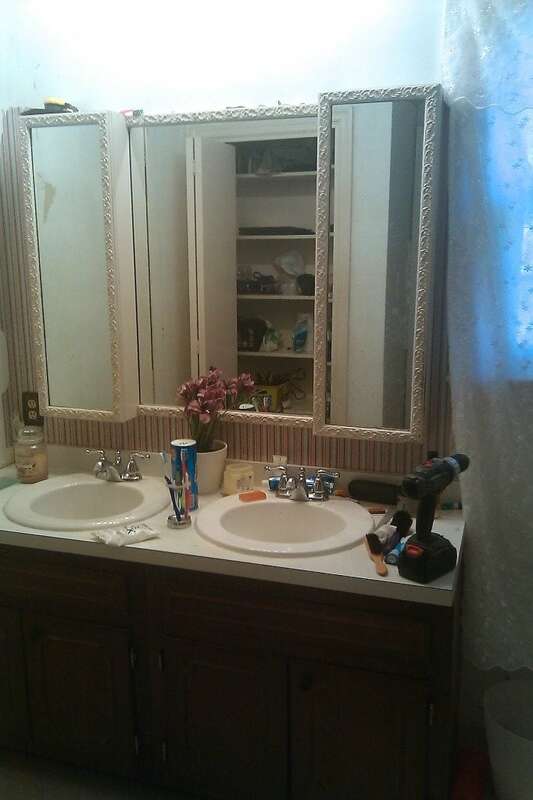 You won’t believe the before and after! Here at Thrift Diving, my readers and I have done room challenges and have made over even more bathrooms. Check them out! Love these tips! You really did a great job! Super cool clean lines, love it, you are so right – go for it attack the eye sore.